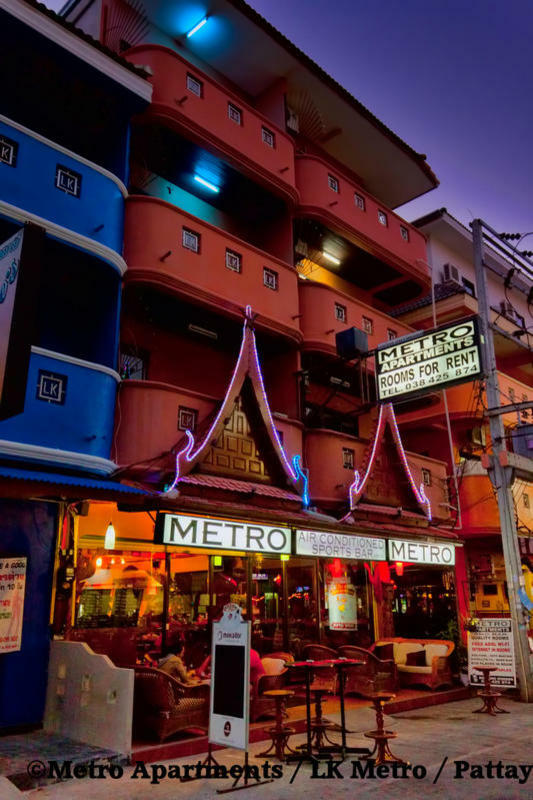 Metro Apartments is run by an Irish / Thai couple and their Thai staff. This blend of friendly Western organization and Thai hospitality results in a pleasant, friendly atmosphere where you can forget the burdens of the past, meet strangers and leave with new friends. Standard rooms are approximately 24 sq m and have a side balcony. Superior rooms are approximately 32 sq m and have a wrap-around balcony to the front overlooking the street or quieter rooms overlooking the property behind. Superior rooms contain a microwave and include complimentary tea and coffee. Downstairs there is a large air-conditioned bar with free Internet access for guests as well as three free pool tables for guests. The bar is non-smoking. Additionally we have seven TV screens to cover a complete range of live sports. For those who prefer to while away a few hours in their room, there is a complimentary book and DVD library for guests. Residents are also entitled to a 10% discount on their drinks bill in the bar. While we currently do not operate a kitchen, we do carry several menus from neighbouring properties. At the front there is a seating area with sofas and easy chairs where you can sit in the shade and people watch or have a cigarette.